Andrea pirlo is an Italian professional footballer who plays for Juventus and for the Italian national team. The 35 year old Italian international hinted to quit his international career after the world cup but the recent speculation showed that he intends to play for Italy. Pirlo currently is not with the Italy squad as preparing for Juventus’ game against Sampdoria this weekend, but says he hopes to be part of the next squad. 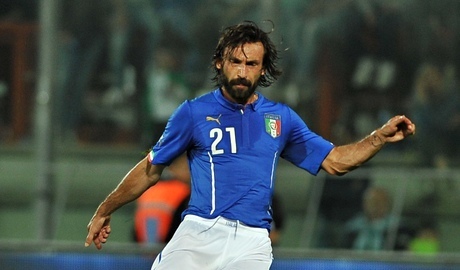 Pirlo is currently the fourth most-capped player in ltaly history with 112 appearances. He told Gazzetta TV: “I have been talking with Conte who asked me if I was ready to play again for the Azzurri and I told him I was. Hiya, I am really glad I’ve found this info. Nowadays bloggers publish only about gossip and internet stuff and this is really annoying. A good blog with exciting content, that’s what I need. Thanks for making this website, and I’ll be visiting again. Do you do newsletters by email? Hiya, I’m really glad I have found this info. Today bloggers publish just about gossip and internet stuff and this is really irritating. A good web site with interesting content, that’s what I need. Thank you for making this website, and I will be visiting again. Do you do newsletters by email?